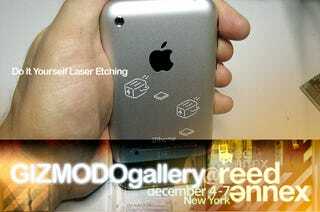 I've always been fascinated with the idea of laser etching all my tech gear, and it looks like I would finally be able to do it at the Gizmodo Gallery. Thanks to Make's Phil Torrone and his laser machine, anyone walking in the Gizmodo Gallery would be able to tattoo their metal gadgets with Phil's laser, absolutely free of charge. (He'll be there on the first day we're open, December 4th.) We will have some illustrations available for people to choose from but, if you follow these instructions closely, you would be able to bring your own drawings to use them with the laser. • First, your illustration must be a vector file. Not a bitmap. If you are not sure what this means, don't bring it. The machine can only etch vector-based files. • Save your vector illustration in Adobe Illustrator format (again, no bitmaps saved inside. Just vector art). • Make sure your illustration is adjusted to your hardware physical features. If you are bringing a MacBook, you can use the templates here.